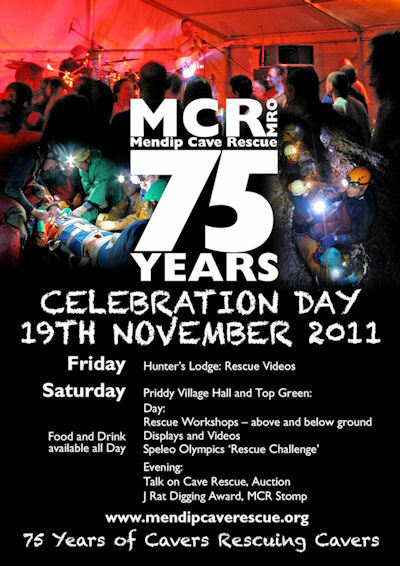 Celebrations for the 75th anniversary of the Mendip Cave Rescue (MCR) will start on the Friday night in the Hunters where we will be showing rescue related videos and clips in the back room. Saturday's programme (details below) will involve, videos, kit displays and various activities such as pitch hauling on a climbing wall, an underground practice rescue and the Speleo Olympics course for a “rescue” race event. 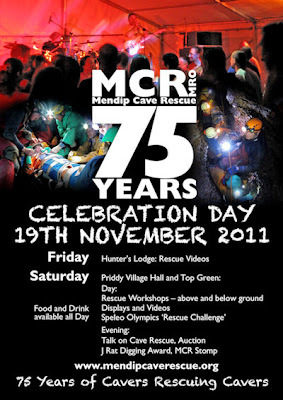 Food will be available at lunchtime and in the evening and celebratory T- shirts will be on sale. The bar will be open all afternoon and evening.